Big Girl - a wombat named for her impressive size - wasn't always so confident. Back in May, she suddenly found herself with her life on the line after she was hit by a car. After a few days of resting at the shelter, and some antibiotics and pain medication, Big Girl returned to the hospital, where the extent of the damage became crystal clear. "Unfortunately, due to being hit by a car, she has sustained a fractured collarbone, bruised lungs and three damaged teeth," the shelter wrote on Facebook at the time. While Big Girl's teeth were certain to grow back, the rescue realized she needed to remain in its care until her collarbone and lungs were completely healed. "In this girl's situation, she would have died without medical intervention," the shelter wrote. "A slow, painful, cruel death would have been inevitable." Even in the early days of her recovery, there was one thing fairly obvious about Big Girl: She had plenty of attitude. For one, she made it known fairly quickly that she did not want hay to be placed in her sleeping area. The biggest challenge for the wildlife shelter when rehabilitating Big Girl was the fact that she was a grown, wild animal and not an abandoned orphan. "She has not had human interaction, so is not used to any human contact at all," the shelter wrote, noting that Big Girl didn't hesitate to show off her infamous attitude when she received her pain medication, bucking and growling at carers. 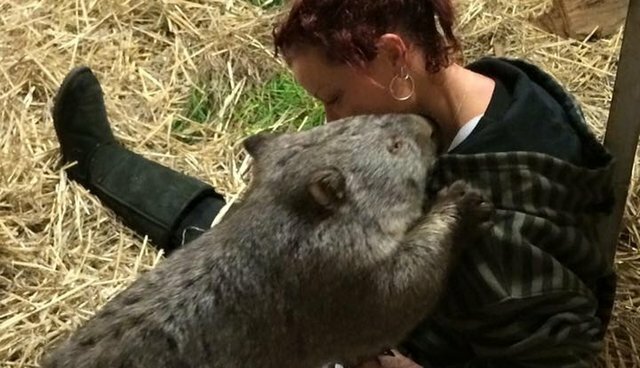 "This is great, normal behavior for a defensive wombat. She is doing what she is supposed to be doing, but gee you need to be on your toes at the moment. Over time, we hope to gain her trust." With time, Big Girl began to do exactly just that - show trust toward her caretakers. ... or give her a kiss or two, when she's really in the mood to show her affection. Unfortunately, Big Girl's collarbone hasn't healed yet, but she's steadily improving. "She is moving around quite well and it does not appear to be causing her any discomfort," the shelter wrote in a recent Facebook post. "Big Girl's teeth are budding through the gums, but are not yet very effective for eating. Therefore, Big Girl will be staying at Narbeview until at least spring and then we will reassess her physical status to make sure that she is releasable." ... because Big Girl rather likes being treated like a Big Princess, too.